I’ve wondered for a while if it might make sense to publish some “HifiZine projects” – fully-documented DIY projects that supplement the many tutorials in the Technical and DIY section here on HifiZine. For me, any such project would most likely be in the area of DSP-based active loudspeakers, with a documented construction guide and a provided DSP configuration file. The idea would be that those tackling their first project would be able to build a DSP-based active speaker with low risk. Then, once they had learned the basics of DSP and speaker design, they could proceed to refine and tweak the project as they wished. This idea hadn’t solidified into anything concrete until recently. There were many questions. For example, the speaker configuration: should it be a 2-way? A 3-way? Integrated subs? MTM? Open-baffle, boxed, or a hybrid? And which drivers? The choices are almost endless, so some firm selection criteria would need to be laid down before even starting. And the electronics…. with the need to buy multiple boxes or cards from different sources, I didn’t see a clear way to crystallize an easily-obtainable, “universal” solution. Finally, the whole lot had to be reasonably affordable but still offer great performance for the money. The catalyst to resolve the dilemma came somewhat unexpectedly. 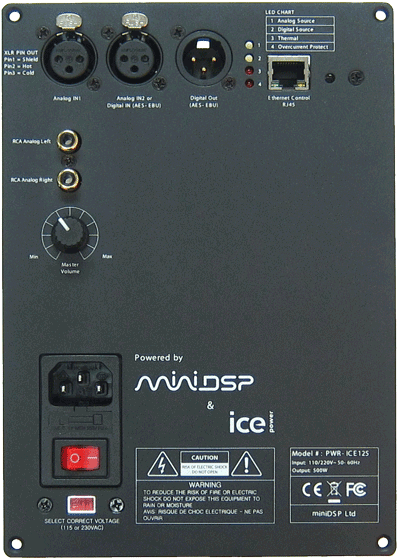 miniDSP recently announced a two-way plate amp that incorporates their eponymous DSP functionality together with a B&O ICEPower module. While I generally prefer separate amps because of the flexibility to “reuse and recombine” into different projects, this new miniDSP plate amp does solve all of the problems of the electronics for this type of project: easy to build (nothing to build at all, in fact), easy to source, and affordable. The plate amp would constrain the speaker to be a two-way. Constraints are good: they reduce the size of the decision space and enable forward progress to a solution. The two-way requirement also counts out open baffle speakers – while it’s certainly possible to make a two-way OB (and I’m working on one with the Involve/ER Audio mini panels), it’s trickier to get a good result and any such speaker will be of interest to a smaller niche of listeners/DIYers. I decided that my preference would be an efficient dome or planar tweeter with a waveguide. The Vapor Audio Aurora is an example of such a speaker. The waveguide serves to limit dispersion of the tweeter at the lower end of its range and increase efficiency – or conversely, reduce distortion for the same output level. But, designing my own waveguide – never mind machining it into the baffle like that – is not something I’m prepared to tackle. It would also work against the idea of a project based on readily-sourced components. I needed an off-the-shelf solution! Fortunately, one came to light, the Monacor DT-300 tweeter and matching WG-300 waveguide. I found a couple of favorable comments online, detailed measurements by Kimmo Saunista here, and use in a project by Troels Gravesen here (although modified, as he often does). Kimmo’s measurements indicate good distortion performance and a possible crossover point somewhere around 1.7 kHz. Pellegrene Acoustics has waveguides for a number of tweeters, including the Vifa XT25, SB Acoustics SB29, and Transducer Labs NC29. Creative Sound Solutions has the Planar2 horn-loaded ribbon. There are no published measurements, but it does look a lot like the driver used in the Soundfield Audio Monitor 2 (click link for measured off-axis response). John Krutke reports a good result with the SB29RDCN-C000-4 in a modified PE 8″ waveguide (search for “February 5, 2010”). The downside here of course is the need to modify the waveguide. In the end, I chose the Seas U22REX/P-SL, which matches all of the criteria except the last. At around $150, it’s a bit more expensive than I would have liked for this project, but relative to total project cost, not excessively so. This fairly new driver is the lower midrange in the Linkwitz LX521 but its parameters and response curve also make it well-suited as the woofer in a two-way. The (nominal) 8-ohm impedance means that the amp module will deliver only (a nominal) 60W into the woofer, but the sensitivity of the driver makes up for it: peak output levels are adequate at 108 dB (at 1 m), or around 105-6 dB once baffle step compensation is included. At these levels, all of the drivers I looked at are excursion limited below 100 Hz or so anyway. The base of the monitor will be removable so that it can be replaced by a stand that turns the speaker into a ported enclosure. This opens up the interesting possibility of having different alignments by swapping out stands. An alignment fairly close to the standard QB3 will be best for rock music; a lower tuning frequency will give an underdamped alignment for a tighter bass; and a larger enclosure with an EBS (extended bass shelf) alignment but lower power handling will likely be favoured by classical music lovers. (Scale below goes from 20 Hz to 200 Hz). 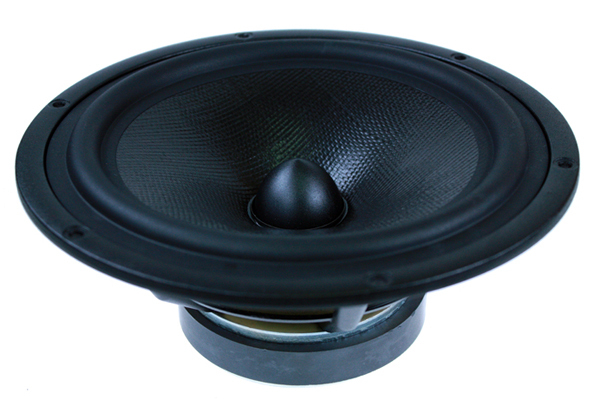 The result should be a speaker with good dynamics, the characteristic clarity of active speakers, and very good top-to-bottom performance without the typical compromises of a two-way. A combined plate amp & DSP satisfies a lot of concerns for new players & seasoned players. It also lends itself to a single speaker project, like a centre channel for HT, which I’m currently contemplating. Do it. I’m really interested to see how it pans out. HI Gee Emm, thanks for the comment, that’s a good point. Lots of possibilities come to mind, if only I had time to pursue all of them! I’m also working on the concept for a smaller option, and that might end up being the first one to be done. If only the plate was sealed it would be perfect for sealed and non sealed applications, but alas the plate leaks like a sieve – a lot of work required to seal it up it looks like too. I am having to do this for a sub plate project. Hi wizardofoz, the amp will be in a separate sub-enclosure. It’s easy enough to do when building the box, perhaps not so easy for a retrofit. I can’t help but think that a DIY effort should be less practical and commercial-like. If I was going to the effort of building something like this (and let’s face it, we don’t do it to save a little money, or to maximise convenience) I would be thinking of some huge three, or four way, system that was out of this world. If I spend $1000 on a small two way with built-in amp, I get something not that much better than I could buy for the same price. If I spend the same on a large three way (maybe cheaper drivers and amps) I get something that really would amaze my friends, and that I couldn’t buy for $10,000. “I would be thinking of some huge three, or four way, system that was out of this world” – Hi Joe, thanks for your comment, I do understand that sentiment and have that system on the drawing board 🙂 However it’s not a two-way so doesn’t really “fit” with the plate amp. Who knows though, perhaps if a three-way plate amp comes along in the future we can do something larger…! Hello John. Yes, I realise that the plate amp is a good thing and it’s only two way. I am enjoying your blog, which I have just discovered. Your ‘About’ section strikes several chords with me: I, too, was very much into music synthesis, and when that ceased to be something you couldn’t buy for a few quid or get for free on a PC it lost some of its appeal to me, although I have lots of recordings of my multi-track efforts from the 1980s – some of which I listen to and think “That sounds like real music. How did I do that?”. The interest in hi fi was always there, and after a baffling interest in amplifiers (why was I interested in that?) the DSP side of things has re-surfaced and fed straight into active speakers which, all these years later, are still virtually unknown in the hi fi world. So just as the synthesiser thing made me feel that little bit ‘ahead of the curve’ all those years ago, my large active speaker system with DSP correction gives me that buzz of knowing I’m experiencing something rather tremendous, that very few other people have. Obviously I like talking about it, but deep down I’d be very disappointed if everyone got them!